Four members of Super Sonic at the start of the twenty first century combined their talent and created a multi-disciplined group Pantasy their objective to perform great music for the satisfaction of pan lovers worldwide. Pan synonymous with Trinidad and Tobago comes to life in late December where tradition causes the emergence of the Pan movement throughout the land to vie for the coveted title "Panorama Champions". 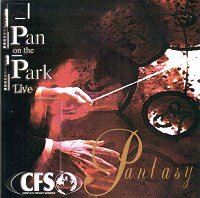 Pantasy catering to the taste of the everchanging audience continues with its wide repertoire of music to excite pan supporters at their live performances. Steelpan the National instrument truly versatile. The members of Pantasy would like to thank everyone who was responsible for the live recording of this group.